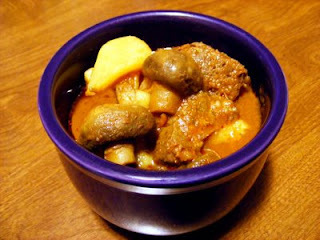 I posted my husband's version of stew and here is the one I grew up on. I added mushrooms but this is my mom, Eva's recipe! I really like it. All of our children like it too. That is a big order to fill in this house. When we don't want to eat meat, yes, that does happen, we just add more mushrooms. We like ours with home made cornbread too. This is "what's cookin" tonight. In a dutch oven pour enough oil to coat bottom of pan. Place meat, mushrooms, and onions in pan with salt and pepper. Brown meat on all sides. Add tomatoes, carrots, mushrooms, tomato sauceand enough water to cover. Cook until carrots are just about fork tender. at this time add your potatoes. I peel and cut everything at one time, I place the potatoes in a bowl of water to keep them from turning pink or brown. When potatoes are done serve in a bowl with a big piece of cornbread! Can't wait for dinner!